Snappy Little Numbers has quietly become one of my favorite labels over the past few years. With little fanfare they've steadily built the sort of catalog that showcases newer, incredible bands. They always manage to turn me on to some new sounds and every time I get a package in the mail from them there is much rejoicing. 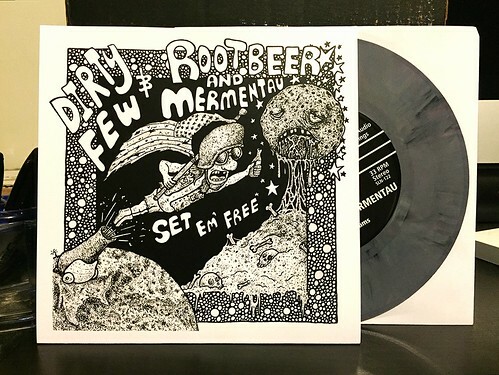 First up in their new batch of releases is a split 7" with two bands: Dirty Few and Rootbeer And Mermentau. Starting up with Dirty Few, the guitar sequel in the first seconds of "Yo Loco" instantly took me back to the opening moments of The Figgs song "Favorite Shirt." From there, the band settles in to a more of a stomping garage sound that reminds me a lot of Welfare Problems era Randy. Both songs on their side of the split are catchy and energetic. I've never heard of these guys before, but it's a solid first showing. On the flip side is Rootbeer And Mermentau. Now, as a big fan of the beverage root beer, I was hopeful that the band would do justice to their namesake. While taking a somewhat similar tact as Dirty Few, Rootbeer And Mermentau leans more towards a fast paced, lo fi sound. At times they remind me of the more heated moments of Boyracer. Again, both songs are pretty good, but with a gun to my head, I probably prefer the Dirty Few side of the record. It's always worth giving a Snappy Little Numbers release a spin. I'm rarely disappointed and always end up with some new bands to listen. Oh and if Mr. Snappy is reading, any new Hooper music in the future? The world is waiting for more of that greatness.